Caudo Vineyard | Easter EGGStravaganza! Wowee!! We are in for a HUGE Easter weekend! 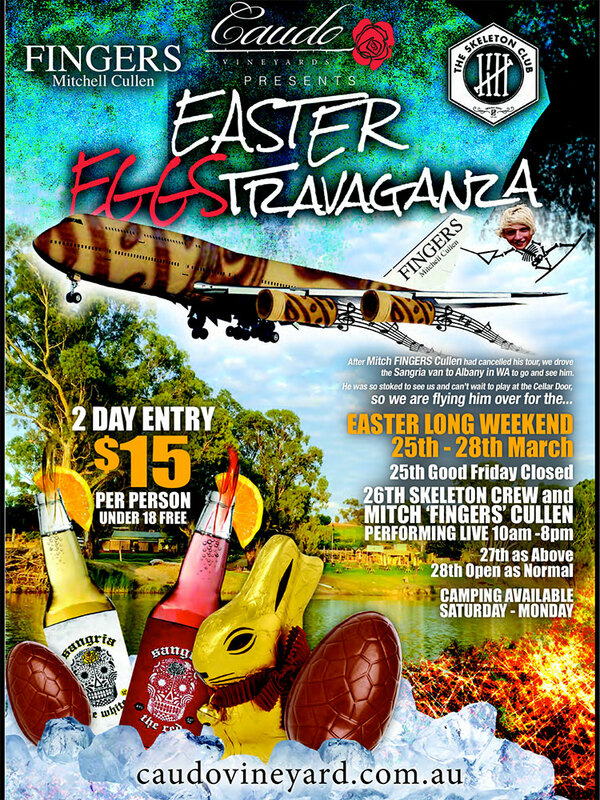 Mitchell “Fingers” Cullen is flying over to play Easter weekend at the Cellar Door with The Skeleton Club Band also! All these guys are talented musicians and we can’t wait to see them in action! It’s going to be a big 2 day event staying open till 8pm both Easter Saturday and Easter Sunday. This is a weekend you shouldn’t miss. $15 entry for adults. Free camping onsite Saturday and Sunday. A reminder that the cellar door will be closed Good Friday! Easter Monday we will trade 10.30-5pm. No need to book for this weekend. The Sangria van has hit the WA Coast with all 4 wheels burning! Trekking up and down the sunny WA Coast from Hillarys to Mandurah it’s been an amazing week. Speaking of amazing, Sangria hit the shores of Rottnest island just in time to be a hit during the Karma Resorts Rottnest Island channel swim which was held Saturday 27th February on Rottnest Island. The Rottnest Island general store is the latest venue to stock our Sangria and from the feedback received, everyone’s thirsts were well quenched. A gorgeous new venue, The Cafe Coast in Wannanup is perfect for those chilled long afternoon sessions by the water with good friends and the crew there were very excited to introduce the new Sangria to their clientele. Definitely a popular drink of choice. The Legends Bar and Bottle Shop are loving it in Attadale with their stocks replenished and ready for all the regulars to mix it it up. The Northshore Tavern in Hillarys has been a hit and word is definitely getting around and from all reports on Facebook, people even further north are driving here to get their fix! Baldivis Liquor Store held a tasting on Friday 26th February where The White was extremely popular with a lot of the regulars. The new van was definitely an eye catcher on the main road for all the workers driving past! Sangria at the Whistling Kite in Secret Harbour has been in huge demand with a steady following of The Red lovers. Stocks have been replenished ready to keep the locals happy. So a busy week all in all for the Sangria van, but every duck needs a rest and the van parked up for the West Oz Wakeboarding State Titles on Sunday 21st February. The Van was a hit with all and even better, after a long weekend of wakeboarding, the Sangria was flowing, the music was LOUD and the dancing was on! Some tired peeps in the morning but a wicked weekend was had by all! So onto a new week of travels as the Sangria van heads down south. Very keen to move in to Bunbury, Busselton and beyond. Beautiful coastlines, long drives and lots of happy travellers keen to try their choice of The Red or The White. Yes! It’s almost here! True Grit is getting closer.. Only 8 weeks away!! Time to get a team together and get training. True Grit is more than just fitness, it’s about commitment, mental strength, fun and lots and lots of mud! There is absolutely no excuse not to do the True Grit obstacle course. You won’t regret the amount of fun you have while sliding down the giant water slide or the sense of achievement after climbing over the Great Walls of Caudo. Last year a paraplegic completed the course with the help of teammates, busting two tyres on his wheelchair. If he can, you can! I can’t begin to tell you the amount of fun that is to be had on the course. A few pointers of advice. Cover your shins. There are some obstacles that require you to get on hands and knees and its helps to wear high socks. Don’t wear your favourite running shoes! Wear clothes that you are willing to get completely covered in mud. Keep in mind you are going to get saturated in water also so avoid cotton clothing. Get your body ready.. 1. Hydrate! Drink plenty of water before. You won’t need to carry a water bottle throughout the course. There are water drink stops along the way with Nippys True Grit electrolytes drinks also. 2. Stretch! Prevent injury by stretching for at least 20 mins before you start. Your muscles will be warm and ready to conquer. 3. Train! Do some light jogging or strength building exercises leading up to the event to get your body in shape. The obstacles are designed to challenge your abilities and push your limits. DONT GIVE UP before giving it a good solid try. There are guides at each obstacle to give you pointers and advice. You will be surprised by what you can accomplish. At the end of the 10km course of 30+ obstacles you are rewarded with a free Sangria or beer which goes down the hatch before you know it. After that, you hose off and can spend the next few hours parading in your new “True Grit Finisher” singlet! A couple of hashtags and a Facebook post to let everyone know you #justdidtruegrit. And that’s it.. You are officially a True Gritter! Congratulations. Put it in your diary now. Saturday 7th and Sunday 8th of May. Registrations are done online www.truegrit.com.au.. Remember there are NO EXCUSES! We look forward to some relief weather after such a tough, long, hot dry spell. The humidity will hang around for the next few days with cloudy skies and chances of patchy rain throughout the weekend. With this increase in moisture, it has the potential to make this the wettest week since winter in central South Australia. Sunday should be mostly sunny carrying through to early next week. An average temperature of 30 degrees over the next few days will make for more comfortable conditions. Riverland West Fisherama and Boat Raffle. The Fisherama is back again this year with the first prize being a boat, trailer and motor valued at over $13,000. Multiple sections for junior and seniors as well as boat and land based fishing sections to enter. Prizes also for the biggest callop and carp caught on the day. Entrants do not need to fish to be in the draw for the major prize. Tickets $35 each or 2 for $60. Apex Park, Ramco Point from 8am. The Main Street of Waikerie closes for the Rotary Club’s street festival. Kicking off from 5pm till 10.30pm. A line up of entertainment includes; Gail Page Band, Stingy Bark McDowell, Dave Blight and Mick Kidd and Steve Brown Band. Novelty stalls, a magician and the Uniting Church Youth Drop In Centre will be open for teens. Head to the Main Street, Vaughn Terrace in Berri for a free breaky at 7am. Check out the many stalls, gymnastic displays, face painting and live music and entertainment. Free entry. The Loxton Chamber of Commerce invites you to enjoy a free Easter picnic at the Rotunda Lawns, East Terrace. With hot cross buns, locally grown fruit and tea and coffee on offer, what more could you want? Well there will be Easter crafts and facepainting to keep the kids entertained and a special visit from Easter Bunny! !